For those of you that know I am from Utica New York, I love this time of year for fresh apples. Actually Mcintosh are my favorite! Whenever I get the chance to have some New York State apples, it's a treat. I love fresh apple pie, apple brownies and this fast to put together apple galette. Flaky pastry with the freshest filling! Stir the apples in a bowl with the jelly of choice and spices. Roll the pastry out on a sheet of wax paper. Place the filling in the center. Fold up all the edges to make a circle. Baste with beaten egg white and sprinkle with cinnamon and sugar mixture. Bake at 400 degree hot oven until browned. Yum, yum and double yum. I love apples and especially Macintosh. I am not a baker but this is so easy even I could make it. Perfect time of year here in NY to get all those delicious apples and make this recipe. It looks SO good. I'm from Rochester, Ny and I agree - apple season is the best! Another yummy, easy and awesome recipe. 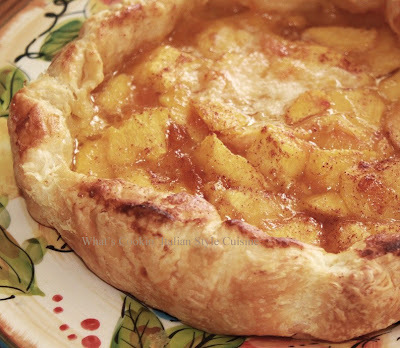 Love the easiness of the crust with the frozen puff pastry, and the delicious McIntosh apples...the best!